The Espero Fund recently contributed to the TomMcCabe fund for refugee youth. 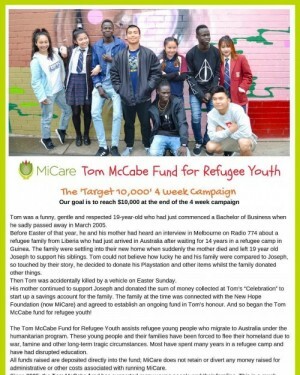 The fund was initially set up by Tom McCabe who donated his PlayStation after hearing the plight of a refugee family which arrived in Australia after 14 years in a refugee camp. Tom sadly passed away in March 2005 at the age of 19 but his legacy lives on in the fund which is now administered by MiCare Ltd. The fund assists young refugees with settlement in Australia.